Tanki Online is a free browser-based 3D action game developed by Alternativa Games. The first version was released on June 4th, 2009, which is now known as Tanki's Birthday. You can play Tanki Online straight from your browser here. For those of you who are on Android smartphones or tablets, you can download a mobile version of the game from the Google Play store. The game combines the charm of Battle City from the NES epoch with modern 3D shooter dynamics, as well as the excitement of online games. With all these great elements, Tanki Online doesn't require hard-drive installation and can be run on any computer with an Internet connection. For those of you who are on Android smartphones or tablets, you can download a mobile version of the game from the Google Play store. The only step away from a battle is registration. Simply complete the registration, which doesn't take any longer than a minute or so, and take part in immense tank battles. The game is completely free, and each tank is controlled by a real person. Player vs player battles hold great potential for providing fascinating challenges, as well as allowing for co-operative manoeuvres. Take revenge on your enemies, form teams, and make tricky tactical manoeuvres — all is fair in war. Battle your way through the rumble of turrets and the groaning of treads to become a truly experienced fighter and tactician. The game has an extensive rank system. The higher your rank is, the more powerful your tank can be. 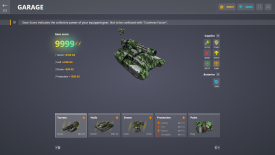 A player gains access to new hulls, turrets, and other tank upgrades, with each new rank. Tanki Online has already received a number of prestigious awards such as Site of the Day at Favourite Website Awards, Best Game without a publisher and Best technology at KRI 2009 and Best technology at the Russian Flash Awards 2009. But project development hasn't stopped. We are constantly working on new elements, as well as organising various contests and tournaments with huge prizes. Everyone can make a contribution to the game. Your ideas and suggestions are welcome! Everyone can find something interesting in Tanki Online. It's an easy-to-learn 3D action game, an arena for serious competitions, and a place where you can make new friends and communicate with people from all over the world. So… get ready to rumble! Free browser 3D game, available on a PC, smartphone, and tablet: You fight in fully 3D arenas with props including buildings, walls, bridges and bushes. The game physics are similar to physics in the real world, so tanks can get stuck in deep pits, roll over or fall off bridges. Only real players: You fight with and against real people. Nothing is AI controlled. Various game modes: You can fight alone against other players in the Deathmatch and Juggernaut modes, form teams in a Team Deathmatch, fight for the Flag in Capture the Flag mode, fight for control of strategic locations in Control Points mode, fight for the Ball in Rugby mode, and lead assaults on your enemies in the Assault mode. Military career from Recruit to Legend: You get experience points for destroying enemies, healing allies, capturing flags, and many other actions. The more points you get, the faster you can level up to the next rank. Tank upgrades: With each new rank, you unlock new hulls, turrets and protective modules. All of these can be bought in the Garage using "crystals" — the special in-game currency. You can earn crystals in battles. You may also purchase them or get them as a gift for inviting your friends to the game. Intuitive controls: You only need four keys to drive your tank — WASD or the arrow keys. Press spacebar to shoot. Players have an important role in the project's development: You can make your own maps, create clans and give your feedback to improve the game. The most active players will be rewarded! This page was last modified on 20 January 2019, at 14:36. This page has been accessed 144,486 times.